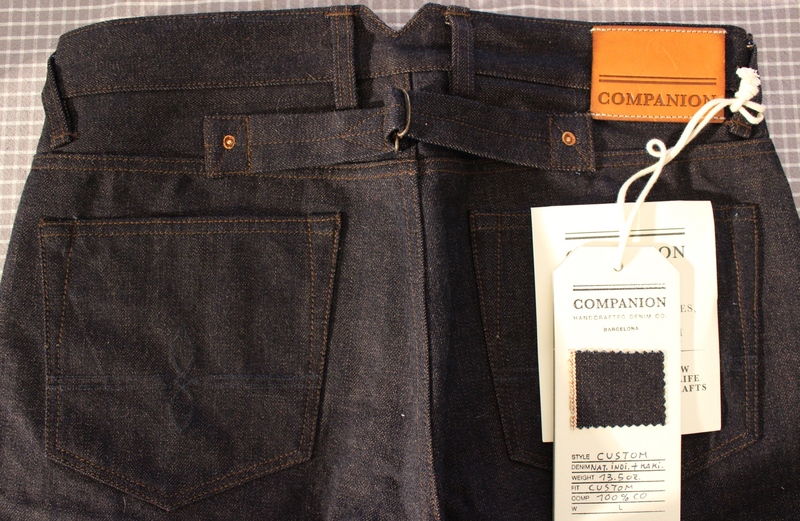 Companion Denim unboxing and review! - Well Dressed Dad - It is a proper menswear blog. Like, with original words and opinions and suchlike. Was it as fun for you as it was for me? Great! I realise that many of the more subtle details aren’t that easy to make out from the video, and as I would have to learn to edit video to rectify this, I’ll add details as photos here. This probably works out for the best, though I will listen to your ideas on this. 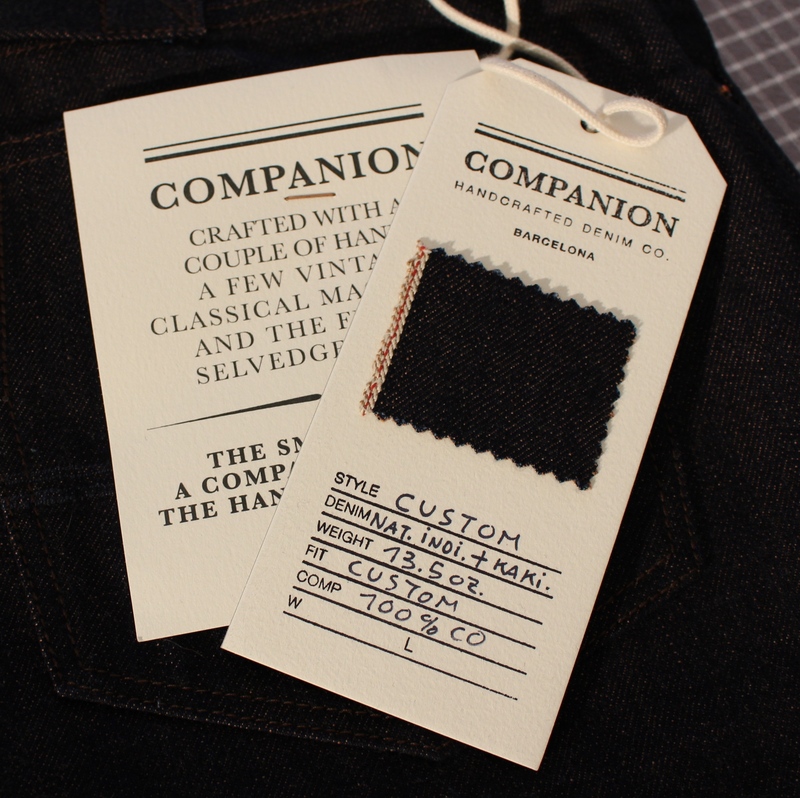 To reiterate, what I am showing here is a pair of custom jeans by Companion Denim in Barcelona. This is a pair of genuine one-pair-of-hands jeans, made from start to finish by Iu, proprietor of Companion. Yes, this means that from hauling the roll of denim off the storage shelf, to marking and cutting, moving on to sewing, riveting and finishing up, to wrapping, boxing and posting, it’s all a single pair of hands. Is this important? I think it’s a nice touch, and it also means Iu spent a day of his life making my jeans. The denim used on these is a very distinctive and rare variant. The warp is natural indigo dyed and the weft is persimon dyed. This gives the weave a distinctly blue and brown hue, looking almost purple as the sunlight shines on it. Weightwise it is a 13oz denim, so not in the heavyweight class, but still to be reckoned with. I’ve never come across a denim quite like it. 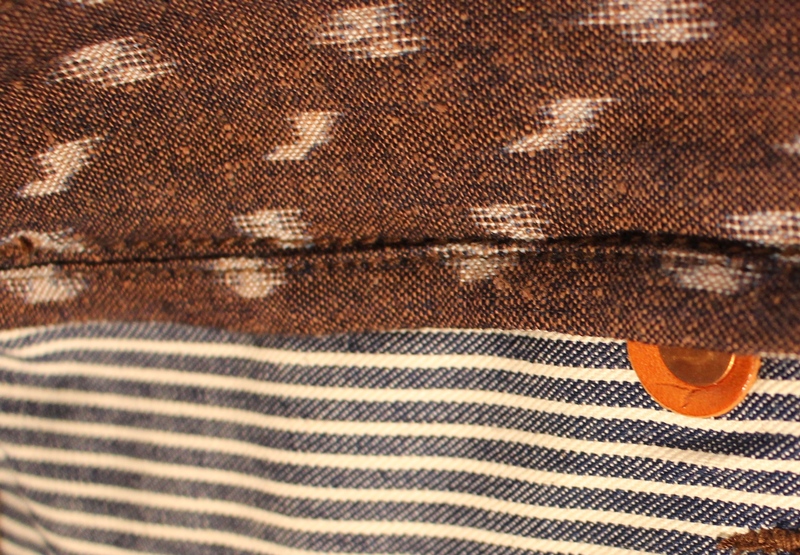 The lining inside is a mix of striped heavyweight cotton pockets and a genuine Japanese ikat fabric. Not that anyone but me will ever see it, but it makes it a little more special. 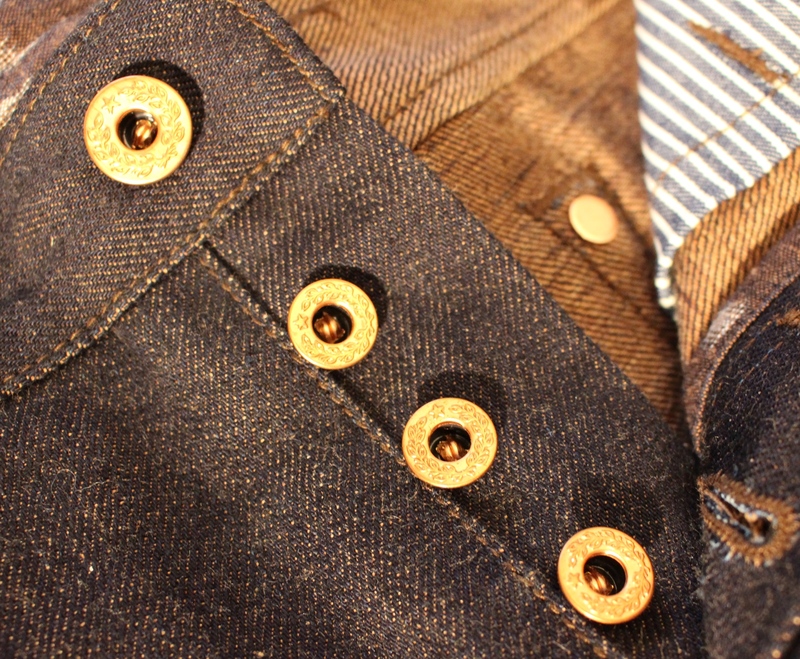 The copper rivets also have leather patches to add strength and stop them for working their way through the denim. At the rear there is a subtle cinch. Not strictly necessary, but I like the look of it and this one is purely business, no fancy goings on. 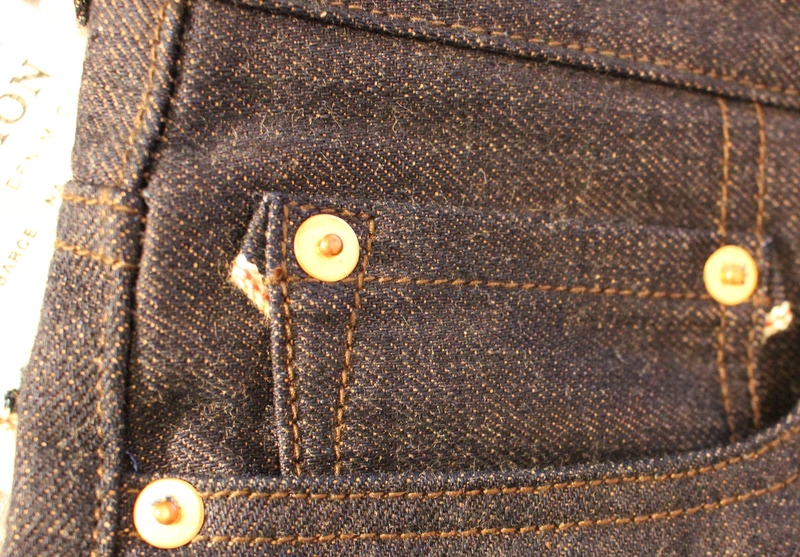 The arcuate on the rear pockets are one of the Companion marks, but in a subtle blue thread. There is also a small selvedge loop that could be used to hang a key chain from. 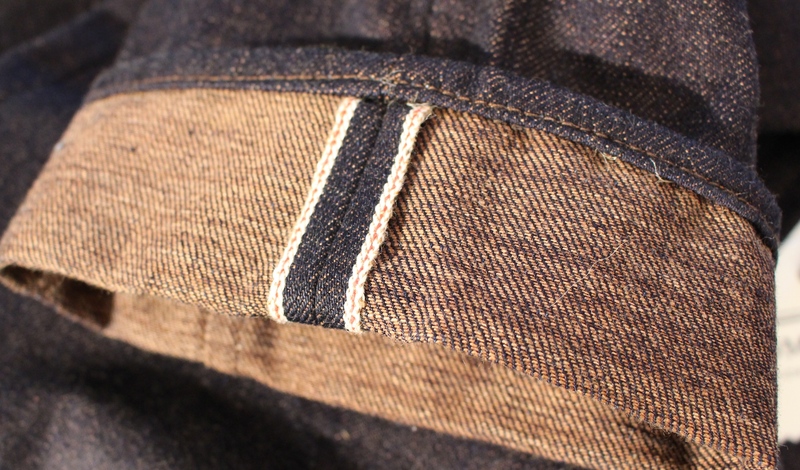 If there was an obvious piece of affectation in the design, it would have to be the hint of selvedge displayed either side of the coin pocket. Again, not something that anyone but the owner would notice. The buttons are vintage-styled copper laurel buttons, also with leather backing. 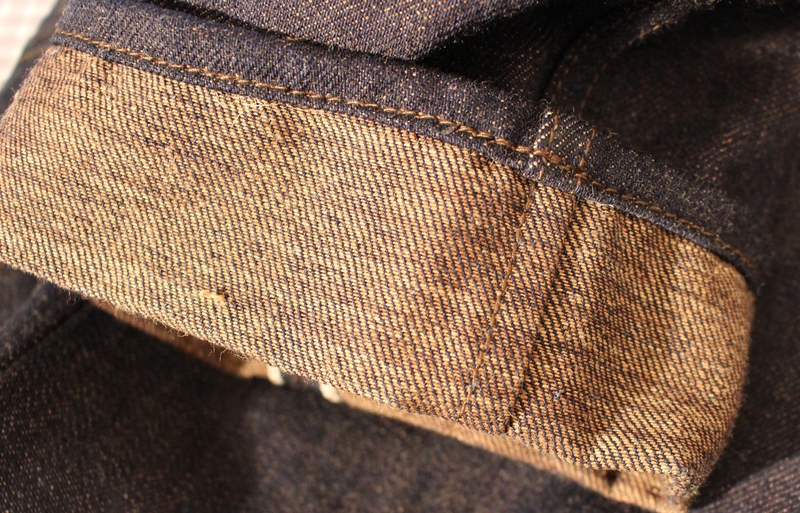 The jeans are sewn with a single needle machine, in the manner of slow, bygone days. I specifically requested that the seams on the inside legs were felled, as to me this is the proper way of making trousers and while it may be difficult for really heavy denim, at 13 ounces it is fine. And the turnup just looks much better when it’s felled and not a rash of overlock seam showing. I’m a bit nerdy in that respect. So, there you have them, my pair of custom order Companion Denim jeans. Pretty sweet, right? hey… fantastic job on the video… easy to understand and good presentation. I enjoyed the unboxing video, WDD, hope to see some more in the future. (Is that a Thoroughstitch box I see?) I haven’t heard of unboxing videos outside of tech. I think it would be nice to have seen you wearing them – perhaps adding a few more review elements to these would be nice as the unboxing element itself doesn’t hold much surprise minus the product itself. I think a lapel mic would be really helpful too, as I found your voice audio low. Great start and I really like mixing things up with video content. I mention this at the end of the video… With all the special options and special denim they came to 450 euros. There are many cheaper options though, and the same great Companion quality!